The Building Topology Ontology (BOT) is a minimal ontology for describing the core topological concepts of a building. This is a Public Draft of a document prepared by the Linked Building Data Community Group (LBD). The document is prepared following W3C conventions. The document is released at this time to solicit public comment. Designing, planning, constructing and maintaining a building are tasks that involve multiple stakeholders each having their own interpretations and requirements for the common dataset. Furthermore, each stakeholder consumes, processes and manipulates information about the building during it's full life cycle. Several industries have interfaces to the construction industry and buildings in particular without this being their main industry. As there is often a need to describe some sensor, product, device in the context of the building in which it sits and as the building is itself also a feature of interest in the context of a smart city, there is a demand for a minimal, extendable ontology that describes anything in its context of a building. The Building Topology Ontology (BOT) is a minimal OWL DL [[owl2-primer]] ontology for defining relationships between the sub-components of a building. It was suggested as an extensible baseline for use along with more domain specific ontologies following general W3C principles of encouraging reuse and keeping the schema no more complex than necessary. This section lists the set of competency questions the BOT ontology answers. This section introduces the specifications for BOT. Space: A limited three-dimensional extent defined physically or notionally. Zones must be understood as a Matryoshka doll principle. The bot:Site instance, <siteX>, contains one building, <buildingA>, specified by the bot:hasBuilding relationship. <buildingA> contains one storey, <storey01>, specified by the bot:hasStorey relationship. <storey01> contains two spaces, <spaceA12> and <spaceA13>, specified by the bot:hasSpace relationship. Spaces <spaceA12> and <spaceA13> are adjacent, which is specified by the bot:adjacentZone relationship. The transitive bot:containsZone relationship is a super-property of both bot:hasBuilding, bot:hasStorey and bot:hasSpace - therefore <siteX> contains all the other bot:Zone instances. A stairwell would be modeled as a bot:Zone, linked to the different bot:Storeys through the bot:intersectsZone relation. Zone - A spatial 3D division. Sub-classes of bot:Zone include bot:Site, bot:Building, bot:Storey, or bot:Space. An instance of bot:Zone can contain other bot:Zone instances, making it possible to group or subdivide zones. An instance of bot:Zone can be adjacent to other bot:Zone instances. Finally, a bot:Zone can instantiate two relations to bot:Element, which are either contained in (bot:containsElement), or adjacent to it (bot:adjacentElement). A site, a building, a space, an appartment or a fire cell. Site - Area containing one or more buildings. A hospital campus or a single family residential lot. Building - An independent unit of the built environment with a characteristic spatial structure, intended to serve at least one function or user activity [ISO 12006-2:2013]. A hospital or an office building. Storey - A level part of a building. Space - A limited three-dimensional extent defined physically or notionally [ISO 12006-2 (DIS 2013), 3.4.3]. A classroom or a kitchen. contains zone - Relationship to the subzones of a major zone. A space zone could for instance be contained in a storey zone which is further contained in a building zone. 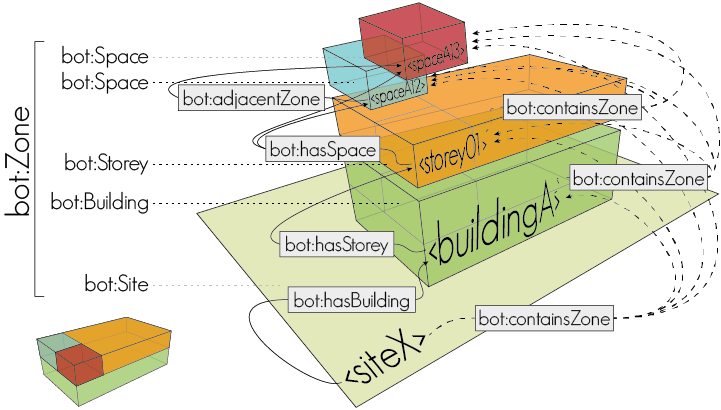 bot:containsZone is a transitive property meaning that in the previous example the space zone would also be contained in the building zone. has building - Relation to buildings contained in a zone. The typical domains of bot:hasBuilding are instances of bot:Site. has storey - Relation to storeys contained in a zone. The typical domains of bot:hasStorey are instances of bot:Building. has space - Relation to spaces contained in a zone. The typical domains of bot:hasSpace are instances of bot:Storey and bot:Building. adjacent zone - Relationship between two zones that share a common interface, but do not intersect. intersects zone - Relationship between two zones whose 3D extent intersect. For example, a stairwell intersects different storeys. Building elements are physical parts of building constructions. Examples of elements include walls, doors, pipes, heaters, lights, smart sensors, tables, chairs. Elements can contain sub elements. Zones can contain elements, or be adjacent to elements. Element - Constituent of a construction entity with a characteristic technical function, form or position [12006-2, 3.4.7]. Any product or device that is described in its context of a building. For example a wall, a chair or a temperature sensor. hosts element - Relation between an element a) and another element b) hosted by element a). has element - Links a Zone to an Element that is contained in, or adjacent to, the Zone. The intended use of this relationship is not to be stated explicitly, but to be inferred from its sub-properties. It will, for example, allow one to query for all the doors of a building given that they have an adjacency to spaces of the building. contains element - Relation between a Zone and a building Element it contains. adjacent element - Relation between a Zone and its adjacent building Element, bounding the Zone. intersecting element - Relation between a Zone and a building Element that intersects it. Interfaces are used in situations where it is necessary to quantify a relationship between two elements or zones or an element and a zone. 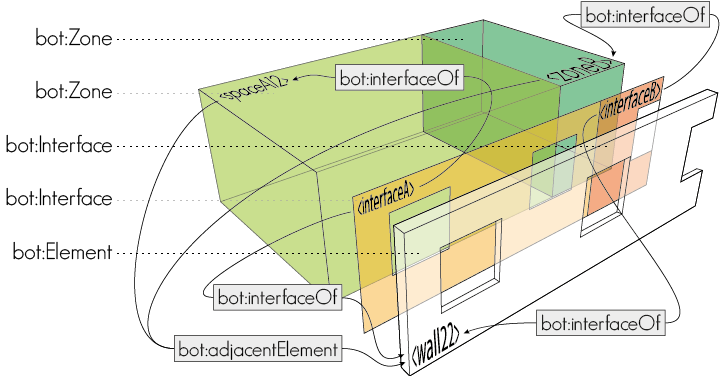 The following figure provides an overview of the core classes and properties that are specifically related to modeling Interfaces. In the figure, there are two bot:Zone instances that are both adjacent to the same bot:Element instance <wall22>. To quantify the heat transfer areas between <spaceA12>/<wall22> and <zoneB>/<wall22> respectively, two interfaces, <interfaceA> and <interfaceB>, are introduced. Both interfaces are related to <wall22> through the bot:interfaceOf relationships, but their second bot:interfaceOf relationship is to either <spaceA12> or <zoneB>. Interface - An interface is the surface where two building elements, two zones or a building element and a zone meet. It can be used for qualification of the connection between the two. A use case could be qualification of the heat transmission area between a zone and a wall covering several zones. A heat transfer area between a space and an adjecent wall, the pipe surface facing the space that the pipe passes through, a joint between two concrete elements or connection between a window and a wall. interface of - Relationship between an interface and its adjacent zone(s) and/or element(s). The bot:hasSimple3DModel datatype property links a bot:Zone or bot:Element to a 3D Model encoded as a literal. Note that we encourage the use of URIs for mediatype with the IANA authority. For example https://www.iana.org/assignments/media-types/model/3mf for the mediatype model/3mf. Other mediatypes for OBJ, STP, IFC, W3D, etc. can be defined. If the data format is textual, then the lexical form of the 3D Model literal SHOULD be encoded as a Unicode [[!UNICODE]] string, which SHOULD be in Normal Form C [[!NFC]]. If the data format is binary, then the lexical form of the 3D Model literal SHOULD be encoded using a base32 encoding [[!rfc4648]]. The bot:has3DModel object property links a bot:Zone or bot:Element to some IRI that identifies a 3D Model. This 3D Model can then be described using some dedicated RDF vocabulary. Else, the 3D Model IRI could be dereferenceable, and when looking up the IRI one could retrieve a representation of the 3D Model with some existing data format for 3D models. has Zero Point - Links a bot:Site to a wgs84:Point that encodes the latitude and longitude of the Zero Point of the building site. has Simple 3D Model - Links any bot:Zone or bot:Element to a 3D Model encoded as a literal. has 3D Model - Links any bot:Zone or bot:Element to a IRI that identifies its 3D Model. This 3D Model can then be described using some dedicated RDF vocabulary. Else, the 3D Model IRI could be dereferenceable, and when looking up the IRI one could retrieve a representation of the 3D Model with some existing data format for 3D models. As BOT is proposed as a central ontology in the domain of AEC/FM industry, alignments with existing domains are provided as separate modules. The BRICK alignment is available at https://raw.githubusercontent.com/w3c-lbd-cg/bot/master/BRICKAlignment.ttl. The following classes in BOT can be aligned via a subclass relation as follows. MHRA: I am not sure I agree with all the alignments we have defined. both brick:Wing and brick:Basement are subclasses of bot:Zone IMO. Additional alignments from BOT to BRICK properties are defined as follows. The DERIROOMS alignment is available at https://raw.githubusercontent.com/w3c-lbd-cg/bot/master/DERIROOMAlignment.ttl. The DogOnt alignment is available at https://raw.githubusercontent.com/w3c-lbd-cg/bot/master/DOGONTAlignment.ttl. The ifcOWL alignment is available at https://raw.githubusercontent.com/w3c-lbd-cg/bot/master/IFCOWL4_ADD2Alignment.ttl. This section informally discusses how to handle common modeling questions such as zone- and element adjacencies and containment or the use of interfaces. BOT defines a Zone as "An area or stretch of land having a particular characteristic, purpose, or use, or subject to particular restrictions.". Any area of interest is hence a bot:Zone. The building itself is a zone and so are all the spaces within it. Grouping sub-zones into one zone can be handled with the bot:containsZone property. In the example below, bot:Zone is used to group spaces into an appartment. bot:containsZone <Bathroom_1> , <Bedroom_1> , <Kitchen_1> , <LivingRoom_1> . A stairwell stretches across the full height of a building and intersects with all the storeys it serves. Modeling the space inside a stairwell can be tricky since it is not just assosiated to one single storey like most other spaces. <Builing_A> bot:hasStorey <Level_1> , <Level_2> , <Level_3> . <Level_2> bot:hasSpace <Space_A> , <Space_B> . <wellLvl1> ex:intersectsZone <Level_1> , <Stairwell> . <wellLvl2> ex:intersectsZone <Level_2> , <Stairwell> . <wellLvl3> ex:intersectsZone <Level_3> , <Stairwell> . Windows are sub elements of the wall in which they are hosted, but there are no logics to infer that because the wall is adjacent to some space, so are the windows hosted in the wall. The reason for this is that a wall can span multiple storeys and hence be adjacent to several spaces where the window should only be adjacent to one space. The following ontologies and softwares produce or consume terms from the BOT ontology. A SPARQL-visualizer example is available here. # A simple two storey building with two spaces at each floor. # automatically inferred that <BuildingA> is a bot:Building. <BuildingA> bot:hasStorey <Storey00> , <Storey01> . # inferred that <Storey00> and <Storey01> are instances of bot:Storey. <Storey00> bot:hasSpace <SpaceA> , <SpaceB> . <Storey01> bot:hasSpace <SpaceC> , <SpaceD> . # that <SpaceA>, <SpaceB>, <SpaceC> and <SpaceD> are instances of bot:Space. # <SiteA> bot:containsZone <BuildingA> . # <BuildingA> bot:containsZone <Storey00> , <Storey01> . BOT may be extended either by specifying subclasses, or subproperties, of BOT elements. The following snippet extends bot:Element with h:SpaceHeater. The following snippet defines h:heatedBy as a subproperty of bot:containsElement. The following example describes a flat in a multi family dwelling modeled in the Open Smart Home data set (OSH) the data set is available here. rdfs:label "Ground floor of the building"@en . rdfs:label "First floor of the building"@en . rdfs:label "Lobby in flat with no sensors"@en . The Editors recognize the major contribution of the members of the W3C Linked Building Data Community Group. bot:Zone added as a super-class of bot:Site, bot:Building, bot:Storey and bot:Space.